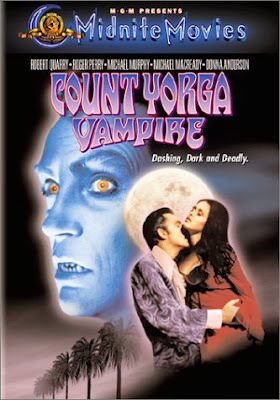 "Count Yorga, Vampire" (1970) brings the story of vampires from the ancient times to the "modern" Los Angeles of the early 70s. Donna has a party and has invited her deceased mother's lover, Count Yorga from Bulgaria. He is conducting a seance in an attempt to reach her deceased mother. When she becomes hysterical, he calms her by hypnotizing her and commands her to do anything he says whenever he says. Paul and Erica offer to drive the Count home in their VW bus. Upon arriving at the Count's estate gates, they are met by his manservant, Brudah, who lets them into the estate and up to his eerie mansion. After dropping him off, the couple gets stuck in the mud on his estate and decide to sleep in the van. They are attacked in the middle of the night but all they don't remember all the details but Erica is left with a bite mark on her neck. She goes to see family friend, Dr. Hayes, who says she's lost a lot of blood and prescribes that she eat lots of rare steaks! Later when Paul brings Michael (Donna's boyfriend) to Erica's house to investigate why they can't reach her, they find her house in disarray and Erica sucking the blood out of her cat! Dr. Hayes is called in and he breaks the news to the men that they may be facing a modern day vampire. This is a fun 70s vampire movie. Count Yorga is dashing and mysterious as the vampire and he has a host of scantily clad female vampires doing his bidding. For a good retro vampire thriller, check it out.